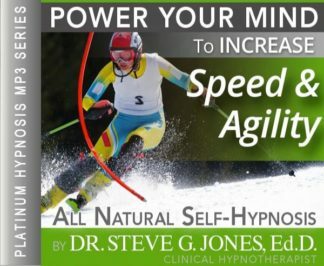 It’s easier than you think with the Increase Speed and Agility Hypnosis MP3. Steve G. Jones, Ed.D., Clinical Hypnotherapist, charges $1,500 for a custom recording and $25,000 for a one-hour private hypnotherapy session at his office. But you can get all the benefits for this low price. Simply listen to the Increase Speed and Agility Hypnosis MP3 session every night as you go to bed for three weeks and feel the changes happening in your life. You will feel more empowered, more in touch with your true self, and you will truly know that your goals are within your reach. Steve G. Jones achieves AMAZING and LASTING results!!! Hypnosis is the easiest way to affect change in your life because the positive messages go straight to your subconscious mind effortlessly so you can accomplish your goals and reach for the stars!! All you have to do is listen to the Increase Speed and Agility Hypnosis MP3 audio at night as you go to sleep!!! You’ll hear soft music, the gentle sounds of the beach, and the soothing sound of Steve G. Jones’ voice all working together to bring about positive changes in your life easily and naturally. Steve G. Jones has been helping people improve their lives with hypnosis for over 17 years…now it’s time for him to help YOU… don’t wait, do it NOW !!! you’ll be glad you did. See you at the top! No matter what sport you participate in, whether it’s running, biking, basketball, or soccer, you probably want to increase your speed and agility. Increasing your speed and agility will make you more competitive and a better athlete. There are many different speed workouts you can utilize to get better. An important thing to remember when working out is to vary your exercises and workouts. Doing the same workouts every week will keep you from getting better. Increasing your athletic speed and agility is more than a physical work out. Getting better at any sport is also a mental workout. You have to be prepared to push yourself and you also have to be motivated to get all those workouts in! I encourage you to explore different ways to increase your speed and agility. Realize that it is a physical game as well as mental game, and you have to be prepared to work on both. And as you continue to relax deeper and deeper and more deeply relaxed, you begin to realize just how powerful you are. You realize that you are a very strong and powerful person. You are an amazing athlete. You take the necessary steps in order to become the best performer you can be. You know the importance that food has on your performance in your sport. You are sure to eat the proper amounts of lean protein, carbohydrates, and fats. Food is fuel for your body and you realize that the food you put into your body will enhance your speed and agility. You eat a low-fat diet consisting of lean protein, whole grains, plenty of fruits and vegetables and a lot of water. You also realize the importance of sleep. You make sure that you get eight hours of restful sleep every night. Now, I want you to focus on your sport where speed and agility are very important. Perhaps your sport is basketball or boxing, or maybe running or soccer. It can be any sport at all. Go ahead and picture yourself playing or competing in this sport. You notice that a key area that you want to improve is your speed and agility. In addition to practicing your sport, you also do additional workouts, that’s right. You participate in additional workouts that will enhance your speed and agility. You vary your workouts and in order to increase your speed and agility you do several reps of short, intense workouts. You enjoy doing these short and intense workouts because you are noticing changes in your body and in your performance. Day by day, as you work on your speed and agility, you notice more and more changes. You are becoming quicker and more agile. Your change in workouts and your change in eating habits has caused you to lose fat and gain muscle, that’s right. You are now stronger than you ever have been before. Your muscles are more pronounced. These firm, toned muscles aide you in becoming the best athlete you can be. Picture yourself doing workouts that improve your speed. Perhaps you are lifting weights in the gym, or maybe you are doing short intense running workouts. Picture yourself doing these exercises. Notice that as days go by and as weeks go by, you are becoming stronger, that’s right. You are powerful and you are getting faster and faster. Now picture yourself working on your agility. Perhaps you are jumping rope or using special equipment. Notice how quick you are. Day by day you are becoming sharper and able to complete your exercises rapidly. Notice how motivated you are. You are extremely motivated as you concentrate on your speed and agility. You really enjoy working out and eating right. You have noticed major changes in your body and in your ability, that’s right. You have made great strides in improving your athletic ability. Now picture yourself participating in your sport. Picture yourself applying all of the power and strength you have acquired. You are so fast and so agile as you move your body. Notice how coordinated you are. All of those agility exercises have really paid off. You are quick and very easily able to move around your opponent. Notice your speed; you are very quick and light on your feet. Your speed exercises have made you faster than you ever have been before. Notice how you feel as you play your sport. You feel fantastic. You feel strong. You feel powerful. You notice that your body will perform and react in whatever way you want it to perform and react. You realize that you have complete control over your body, that’s right. You have complete control over your body. You feel more alive than ever before. You realize that whenever you want to move a certain way, your body reacts easily and effortlessly. Your legs move quickly and you have complete control over them. Your upper body is strong and moves right along with your legs. And day by day as you continue to workout your body, your speed and agility keep improving, that’s right. You keep getting faster and more agile and that feels wonderful. You have the amazing ability to control your body with your mind. Hypnosis puts you in charge of your body! You can use the Increase Speed and Agility Hypnosis MP3 session to improve your workouts no matter what sport you participate in. You have control over your workouts, right? Well, your subconscious mind also is in control. If more speed and agility is what you seek, you can program your subconscious mind to take action and increase your speed and agility. Hypnotherapy is a powerful tool. Your body is capable of achieving great things and can be pushed to extremes. If you have reached a plateau and wish to improve your speed and agility, then you will benefit from this hypnosis session. Hypnosis will re-program your subconscious mind to make you increase your speed and agility so that you reach your potential. We suggest you listen to the Increase Speed and Agility Hypnosis MP3 recording for 21 nights as you go to bed at night. The powerful suggestions contained in the session will help you achieve the goals you are after. To continue seeing results, we suggest you listen to the recording on a weekly basis after you have listened to it for the initial 3 weeks. You can continue to improve with hypnosis! Hypnosis has a psychological effect and as an effective strategy to increase performance of their athletes by through motivation, emotional stimulation, and concentration (Using Hypnosis to Enhance Self-Efficacy in Sport Performers).